Describe about the Ikea Company and its goals and objectives? The organisation that will be assessed in this paper is Google Inc. It is a technology firm that specialises in various different fields particularly in providing services related with searching the web. The aim of this unit is to assess how the chosen organisation manages the factors of communications, knowledge and information. In the context of the overall business processes and functionalities of the chosen organisation an assessment of communication knowledge and information will be completed. The tasks that will be done in this paper are as follows: understanding how to assess the needs of knowledge and information; creating strategies in order to increase personal networking in order to widen its involvement in the decision making process; be able to develop communication processes; be able to improve systems relating to knowledge and information. The term ‘decision’ refers to any resolution or conclusion that is reached upon by an individual or an entity after the process of thorough consideration. When assessing the factor of decisions that take place in a large multi-national firm such as Google, it is observed that such decisions can be divided into three levels. These are strategic decisions, tactical decisions and operational decisions. The different categories of decisions that needs to be taken in order to arrive at the clear description of what Google needs is dependent upon these mentioned levels of decisions. In strategic decisions, the top executives decide the overall direction of the organisation i.e. decisions regarding acquisitions and product pricing. Decisions of pricing should be taken by the CEO (Barnes, 2002). The tactical decisions include how to better utilise the human resources department, and how to make the production department more efficient. The operational management decisions include making sure if an employee is following its task routines, and if an employee is abiding by the policies. When assessing the sources of information, it is seen that the factor of quality relies upon the reliability, timing and cost factors associated with data/information itself. Following are some of the sources of information for Google. The internal sources include all those entities within the firm that provides it information, for e.g. middle-level managers and general employees. This information can be of their overall performances. The external sources of information are news media outlets and government. The primary sources of data and information are those that are utilised, funded and/or managed by Google. These include its own research and development sector. Secondary sources of data and information include those entities that are not part of Google but whose data/information is utilised by it. These include research reports by different analysts. Tech firms must invest heavily upon their primary sources of information (Curry, Flett and Hollingsworth, 2006). Secondary sources of information are often not reliable for a firm for its attainment of the necessary data (Desouza and Hensgen, 2005). Here, information/data that is attained after a thorough research process is often costly but is usually deemed as reliable for the organisation. Such data more often comes from the primary sources. Formal sources of data and information for Google include meetings and emails that are sent within the firm. Information sources of data and information include chats or other personal communication that takes place between various different personnel within the organisation. However, the managers and general employees can provide effective information about the firm and the activities of the firm in relation to different work opportunities. They have the real experience about the performance of the company. The research and development sector of Google has provided the clear as well as particular information about the process of the organization. The media outlets or different secondary sources are effective for the purpose of the process. Research report has provided accurate data about the process. Employees or managers of the organization often do not provide proper information about the company as it can cause harm to the reputation of the company. The Goggle has an image within the competitive sector of this particular industry. Therefore, the employees and managers of the research and development sector of this company will not provide proper information about the process of decision making of the organisation. However, the research report of different analysts may also have some gap with the data. Those researchers can face issues while collecting information from different sources. Based on the selected organisation provide examples. The knowledge hierarchy associated with any tech firm such as Google is as follows: Data, this includes raw facts; Information, this is the refined from of data which answers various different questions; Knowledge, this is the application of information. The factor of information and knowledge can support the managers in making effective decisions. This can be done by better identifying the facts that are associated with the overall business activity. Better knowledge of information and facts lead to better decision making by the managers (Dossick and Neff, 2011). Here, the types of information along with their example are as follows: Strategic information relates with the information regarding competitor’s activity and the current trends in the tech industry; Tactical information can refer to the productivity of HR department or the efficiency of complaint management system; Operational Information can refer to an employee’s overall progress and its disciplinary record. Strategic information helps to describe the activities of different competitors within the same industry. Strategic information helps to demonstrate the action of other competitive firms while operating the business activities. On the other hand, tactical information can describe the technique or process of Human resource department of the organisation. This type of information helps to describe the efficiency of human resources within the organisation. This type of information helps to describe the complex system of management system within the organisation. On the other hand, operational information can deliver the aspect of progress within the organisation. All these types of information are very much helpful for making decision within the organisation. These types of information help to provide several types of information within strategic, tactical level within the organisation. The knowledge hierarchy is a list ofsuccessive factors required to comprehend something. 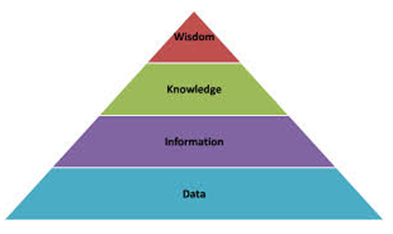 The pyramid suggests that to acquire wisdom there needs to be an acquisition of Data, which is the largest quantity. Information is the data that has been given meaning. Knowledge is adding significance to that information. Wisdom is that dissemination of the previous factors on the hierarchy to discern or judge right from wrong, Bellinger (2004), Koohang, Haman, Britz (2008). Data: Data is documented (captured and stored) symbols and signal readings. Symbols include words (written and/or verbal), numbers, illustrations, and images (still &/or video), which are the basis of communication. Whereas Signals include sensor and/or sensory readings of light, sound, smell, taste, and touch. Information: It is a message that contains appropriate meaning, insinuation, or contribution for decision and/or acts. Information comes from both present (communication) and past (processed data or ‘restructured picture’) sources. Fundamentally, the function of information is to help in making decisions and/or resolving issues or realizing an opportunity. (William D. et al 2006). Knowledge: Knowledge is the acknowledgment (know-what), capability to act (know-how), and comprehension (know-why) that exist in or is contained within the mentality or in the brain. The function of knowledge is to generate or boost the worth for the project and all its stakeholders. The means to understanding the complex relationship between data, information, and knowledge is at the basis of data and information. The source of both is dual - activities and situations. Both activities and situations produce information, which is either gathered thus becoming Data, or become insensible (lost). Recall that information is at its core a message that is created from activities and situations. However, information exists in in storage media (database, print, video tapes, etc.) in the form of data, or in the human mind as knowledge (in its simplest form of know-what or the higher forms of know-how and know-why). This also clarifies why people often categorize data and information, as well as information and knowledge as the same. However, they are not the same in terms of their conventional separate descriptions. These distinctions can help us formulate the comprehension in terms of organizing data, information, and knowledge within the business model or organization. The importance or value of descriptions cannot be overstated when it comes to implementation of organization activities and business plans (William, 2006). Strategic- these are made by the top levels of the management and can affect the course in which the organisation goes. Tactical- These Decisions are made to assist in implementing the strategic decisions they analyse the resources available including human capital and money. Operational- it concerns with the day-to-day decisions about how the business runs and these are normally more accurate in terms of their result. Expansion, project plans project details etc. Information and knowledge play a central role in contemporary businesses. Due to the difficulty of business processes individuals need elevated degree of knowledge, ability and proficiency (Menon, and Pfeffer. 2003). As economy is altering directly, the capability to understand and answer to this alteration depends on the quantity of information and knowledge and business has. Each level of management has some kind of responsibilities and to take decisions they need knowledge and information. Being aware of the level of knowledge an organization has is complicated as it fluctuates according to implicit and explicit knowledge of each individual. Even discovery and selecting which knowledge is maximum worth for the organization for decision making is also an unfeasible job. Organisations are inclined to use appropriate new technologies to foresee the changers rather than to react to changes in business decision-making. The knowledge and information an organization has should be appropriately managed with knowledge management methods and region of recovering active business processes, new products and services development and strategic position improvement. This can be accomplished by developing knowledge which are exclusive, pertain the knowledge to innovate, economical position reinforcement, organisation’s stability maintenance. Information and knowledge are quite essential to decision making in Human resource management, Marketing & sales, Administrative systems, IT, departments of an organization (Menon, and Pfeffer. 2003). Some of the justifications for recommendations for improvement are as follows: Google must invest more upon Research and Development procedures. This would allow it to attain better information from the available data thereby helping it in making better short and long-term decisions. Investment in R&D allows better productivity for an organisation (Gottschalk, 2007). Proper investment in R&D is essential for any organisation that wants to grow itself; this would also allow it to tackle the factor of competition more effectively (Kebede, 2010). Google can make improved use of several of the methods available to them such as T charts and decision matrix by using these diverse options can become clearer and can help while making the final decisions. The internal and external communication of the organization makes an impact only when beneficiary understand exactly the information of the correspondent. It depends on several factors that affect the operations of the organization. To improve its communication system Google must eliminate the hurdles of communication process. To transfer the information efficiently, the manager must eliminate all the hurdles at different stages of the organization. There are two types of hurdle - internal and external. The major part of communication is interaction among employees and manager. Therefore, managers must build a calm environment to increase the efficiency of communication among employees. Also selecting the correct communication design also helps in improving the effectiveness of the organization. There are many designs that manager can apply within organizations such as face-to-face meeting, audio and videoconferences, telephone call and so on (King, 2008). Also the latest developments in technology can help ensuring the communication process operates efficiently. The organization should also implement ways to listen the feedback from subordinates and consumers. This will help in improving the communication, along with ensuring that the support system works effortlessly. The manager plays an important role in maintaining the information system (William, 2006). They can install, update, monitor and manages business applications, along with controlling the database system to ensure that all database and service in organization are functioning appropriately. Secondly, Google can increase the speed of its communication processes in the following ways. All information and messages should be transferred via local computer network. Also using intranet is a good way to develop efficient communication system. The Staff can use Skype and other messenger services to have real time conversation, thus saving a lot of time. The use of ICTs could help Google expand the market and enhance the quality of services, lower prices, and faster distribution of its services etc. CEOs can conduct customary meetings to emphasize the significant aspects and mission of that particular period of time, which can be either weekly or monthly. Also changing organizational culture is excellent way to improve the communication system of the organization. A good culture connects the people of the organization internally as well as externally thus helping them work and communicate effectively. Google needs to plan a strategy to improve and minimize the negative effects from the outside, which affect the organizations performance. The main issue is to determine which information and knowledge must be provided as it is often considered as confidential organizational resources. The ease in information management and analytics is highly important for successful operation of an organization. In today’sdigital times, the technology is developing at a rapid rate, thus this affects the way an organization uses and creates the information. First, Google should identify the weaknesses and issues with the system and then start planning eliminate the barriers. All information should be stored in online cloud sharing applications, so the employees of the organization can access them through the Internet. Also Intranet is a useful tool for an organization to share information between departments, the intranet helps to keep the information confidential sharing it with only the authorized people. Additionally, it is also used to alert the employees about the information through e-mail. It is important for an organization to conduct weekly meeting, as the meeting help in evaluating the work done throughout the organizations as well as they are a good platform while assigning work to the employees. Google should focus on creating an organizational culture, which helps and supports information gathering from various sources. It is essential for the manager in strategic and planned decision-making. In order to ensure the effectiveness of system, it is significant for Google to control operating and functioning of the system. Utilizing application software will help it integrate the database and create a report and survey. Management can effortlessly organize and run system more effectively as compared to the previous times. It ensures that the access to data is only provided to the authorized person. Furthermore, the structure of organization will transform as roles fluctuate. This will lead to integration of systems at the operational level. Data management is fundamental in digital age because it is the information, which supports the organization to be successful in business and compete with their competitors. 2a. A stakeholder is an individual or an entity that has any stake in an organisation. These can be classified on internal, external, primary and secondary basis. The internal stakeholders are those who are directly employed by the company, these include the managers and employees. External stakeholders are those that are involved with the firm but are not directly employed by the firm, for e.g. suppliers and customers. The primary stakeholders are those who are directly affected by the results of the organisation. Secondary stakeholders those who have a stake in the decision-making process but are not directly affected by the results of the organisation, this includes NGOs and funding organisations. However, the company can maintain effective relationship with the stakeholders of teh organisation through different tools of new media. Big data and cloud computing can help the stakeholders for gathering data about the company. For Google, its internal stakeholders are its employees as well as the management. The external stakeholders are its suppliers of equipment; this includes pc and furniture. The primary stakeholders are its workforce whereas the government of United States can be deemed as a secondary stakeholder. It is believed that customers tend to have the most positive or negative influence on the firm’s efforts. Here, the senior level management is likely to be most affected by the effort. Google must regularly utilise different factors of communication in order to work with stakeholders that have different levels of influence and interest in the firm. The term ‘personal network’ addresses a defined set of social contacts of a person among which the person could expect to stay in interaction. Personal networking can greatly assist the general workforce in their various different duties (Leidner, 2010). This is more often done for the attainment of support that is required for the conduction of a set of activities. The management of Google with its stakeholders can use personal networking in order to develop better business relationships. This can significantly affect the decision making process of Google. Decision making- It can help in the determination of the overall requirements of any specific organisational department. Buying power- It can help in determining the various different buying capacities of different categories of customers. Product supply- It can help in understanding the overall demands of the suppliers. Personal networking, "is the result of each person’s "societal decisions" - which is the result of a set of "choices" by each person in the population" By using the personal network an individual operating at a decision making position in an organization is more capable to make decision due to the range of information that are available to the decision maker. When a manager who is in charge for decision making takes the effort of diverse individual through his personal network and is more capable to make reasonable decisions due to contribution from the diverse people that form his personal network (Davenport, 2000). For example a manager is making decision, which involves issues related to personnel range. If he rejects anapplicant, who he considers is not capable for the job, he can take legal action the organization as well as the manager for defying laws related to equal employment opportunity. Thus if the manager who makes the decision took the required input from a lawyer who is a member of his personal network the situation could have been different. Lack of communication among stakeholders, which could be a major potential obstacle although open communication is a main tactical tool in defying problems. 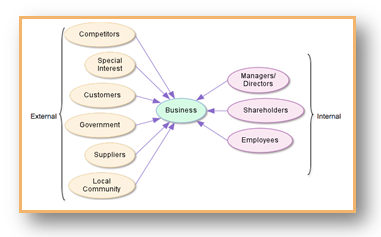 Stakeholders cooperate with each other and are associated to each other in diverse ways (Oliver, S. 2006). Leadership, administration, mission and mainstay values must be combined in a stakeholder-inclusive culture and should there is noteworthy detachment in any area; reliability and reliability will be destabilized. In addition, every organisation necessitates an apparent long-term vision in order to secure stakeholder commitment, which needs short-medium term purposes and objectives to be placed and accomplished. Stakeholders may work together and influence each other in order to change corporate behaviour. Restricted and provincial stakeholders who are concerned with the authority of production activities on their daily life and routine activities. International stakeholders are usually affected by observing and assessing plans which impact to make sure that the impact is not superior to what was considered previously. Any techniques in management would have to face the same difficulty in its functioning particularly a negative perception. Inadequate management may also replicate to the failure to identify stakeholder and missing requirements specify that the force of project to stakeholders can be set into positive and negative effects (Oliver, S. 2006). Design strategies that can be adopted by your selected organisation to improve personal networking to widen participation and involvement in the decision making process. 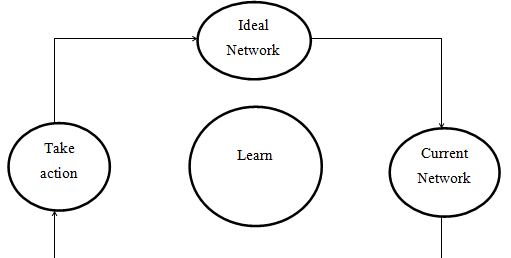 The following network strategy can help in bringing improvement in personal networking at Google. This would widen the circle of participation for different stakeholders and would allow them to get involved in the process of decision-making. Firstly, it is essential to define the desired opportunities that the management of Google wants. In this reference, the management must determine which networking mechanism may generate these opportunities. Here, it is also important to define instances where the firm will be able to generate opportunities and where it would turn those opportunities into values. Google must thoroughly examine its existing network and assess what opportunities does it generate and how it turns those opportunities into values. From its existing mechanism, the firm has to identify ways through which it could reach towards the position of its ideal network. Finally, at the action phase, the firm has to implement the new findings that it has taken note of. Some of the ways through which the concept of personal networking may get improved are as follows: Google can allow better and more effective utilisation of different social networking tools at the workplace. Firms must emphasize the usage of latest tech tools for its workforce (Maier, 2007). However, with the changing aspect of online technology, this company can acquire tools of social media for enhancing the involvement as well as participation of the internal and external stakeholders of the organisation. Every employees and stakeholders use different tools of social media, like face book, twitter. Therefore, this particular organisation can improve the productivity and relationship with the employees of the organisation. Better utilisation of tech tools result in better productivity from the employees (Moustaghfir, 2008). This must be done regardless of the fact that the tools being utilised are of their competitors. Google can also make it compulsory for its employees to utilise smart phones throughout their official duties, thereby benefitting them in their operational activities. The stakeholder can be able to relate with the information of the company. Big data and new innovative tools can be very effective for the stakeholders in order to gather effective information about the company.. The existing processes of communication available at Google tend to address all of its needs that are relative with organisational communication. This is evident from the fact that the organisation is known to take many timely decisions regarding its overall business functionalities. Better and more effective communication methodologies allow an organisation to take timely decisions, this benefits the organisation in its overall decision making (Ruff and Aziz, 2003). The organisation has implemented many mechanisms that have allowed it to perform different communication methodologies such as formal, informal, internal, external, and so on. The internal communication methodologies being applicable at Google are as follows: For personal and informal communication, Google promotes its workforce to routinely interact with each other. Here, the aim of Google is to make the employees feel better connected with each other. Besides the informal way of communication, the organisation also has an efficient mechanism of online communication in place. This involves the utilisation of email ids of the working personnel. Communication methodologies within an organisation must be made as simple as possible since this would allow the workforce to communicate with each other in an easy manner (Sandberg and Targama, 2007). Such ideas are often known to be utilised by the workforce to communicate with their peers as well as their senior staff members, including the management. An efficient internal communication network can enable an organisation to perform its overall tasks well, thereby making it better in terms of productivity (Sugumaran, 2002). The senior level management at Google is also known to conduct meetings on a regular interval. This is done in order to keep everyone updated in terms of the recent developments that are being taken place. Such meetings often end up with the production of newer set of guidelines that are implemented throughout the organisation. Google has designed and built an effective information system that helps the organization to analyse and review the internal and external information. Internally, the Management Information System (MIS) (Hannsen, M.T et al 1999) department is one of the imperative departments of an organization. The main function of a MIS system is to collect, analyze and transfer data within all departments of the organization. The data can be obtained through internal or external sources stakeholder, public or media. Employees of different departments are responsible for collecting and analyzing the data and information from different sources such as consumers, retailers and local communities etc. Also each department makes a personal report about the financial performance, which is evaluated by the managers. These reports help the managers to plan, organize, direct and control the different activities of the organization. In an organization, manager or leader have many modes of communication that include meeting and conferences, workshops and training events, internet, email, computer system and so on. The top tier managers will use email, memo or notice board to communicate with subordinates. To ensure that communication does occur, feedback from all the employees’ id the organization should be taken. Feedback can be taken through any verbal or non-verbal reaction and response, through the various modes of communication. All department of Google are linked together and make decisions together. Customer services department uses several surveys to find out what consumer wants and needs, thus the marketing department while promoting a project then uses this information. Besides, the technology department to create and design new services to meet the requirements of consumer (Hannsen, M.T et al 1999) also uses all this information. The MIS plays a very important role to ensure the communication process of the organization operates smoothly. Board of directors conduct regular meeting to discuss and formulate new plans for the organization every week. All decision taken and policies formulated are then informed to all department and staff, so that they can be implemented quickly. The external communication methodologies being applicable are as follows: The firm tends to stay in touch with all of its external stakeholders. This includes all of its suppliers, the government and especially the general customers. Here, Google tends to take different approaches when performing external communication. It is also known to stay in touch with the top-level governmental officials regarding their concerns with the organisation, this is done through meetings and phone calls. The suppliers of the organisation are communicated on a routine note. This is done by the method of calls and emails. The general customers are regarded as the biggest possible external stakeholders for Google. Here, any effective communication strategy being applied by the firm must take note of the fact that the consumer base of their products is situated worldwide. When dealing with such a large amount of customers, it is essential to utilise communication tools that can be easily accessed and used by the majority of the populace. Here, Google often uses emails and feedbacks in order to stay in touch with its vast customers. The usage of online tools for external communication processes is immensely utilised by many tech firms (Zeleny, 2005). This allows Google to better interpret the demands, desires and other relative points that are mentioned by the customers. The mechanism of communication being utilised by Google can be deemed, as near perfect, still there are various improvements that can be attained by it. Some of the ways through which improvements can be made here are as follows: In terms of internal communication, it is often observed that the employees of Google invest a huge segment of their time in performing personal face-to-face communication. What do I want to be able to do better? How will I recognise success? How will I review and measure my improvement? What methods will I use to achieve my learning objectives? How will I practice and apply what I learn? Quick flow of information would enable me to make timely decisions thereby improving my abilities of professional judgement. I can utilise the latest technologies such as smart phones. Implementation can be done by regularlyusing smart phones for my official duties. I need the latest smartphone available in the market. Success can be recognised if my peers are better able to understand what my overall concerns are. I must practice my lessons from the seminars and classes that attended at the workplace. I may need at least a month. For a huge organization like Google, which has its present internationally, it is highly essential for it to have an integrated communication system within the organization. The organization should be able to effectively use several modes of communication while communicating internally as well as externally (Oliver, S. 2006). Personal Email: It is one of the most convenient communication tools for all employees. The main advantage is that it is more convenient and saves a lot of time to contact other people. Also it is easily accessible, people can check their email accounts from anywhere throughout the world. Each department in Google should have a separate email address to contact and transfer information. This method is flexible for the organization and allows employees to send many documents at once. Moreover, it also creates a connection and integration between the different departments of the organization. Power point Presentation: Presentation is also a useful technique to transfer the information, especially during meetings and conferences. Many complex ideas can be presented effortlessly and great effect with beautiful slide by Microsoft PowerPoint software. A good presentation is essential in creating a good impression among listeners. Calendar notes: another effective communication tool is the calendar note. They are helpful in creating meeting appointment or task deadlines for employees. It also allows the organization to assign the main KRA for each task and manage the work done by employees every day (Oliver, S. 2006). Meetings and group discussions: In any organization, team meeting and group discussion play an important part in the communication system. The main objective of the meeting is made known to the employees in advance. Meeting can be done for various reasons, some of the most common type of meetings are, project meeting, conference, teleconferencing and videoconferencing. It can be formal or informal depending upon the objective or the topic of the meeting. Collecting data: for integrating it communication system, Google must build and design the customary communication system. Google should also include a formal form of report for all level and department of the organization. In addition, manager should eliminate the hurdles among different departments to support employees and collect information effortlessly. The organization is also equipped with the modern LAN network to connect all departments. Google should collaborate with best partners is FPT Telecom to provide a modern equipment to create better technology which will help in effective communication. A strong communication system can support the organization to improve the transferability of the information. Google should also undertake training program to train its employees about the new communication system. (Davenport, 2000). Formatting data: Designing the customary format for current systems is crucial to ensure the effectiveness of the process. Google should conduct the formatting to keep information short and clear. Disseminating information: with the developments in technology one of the latest ways of communicating, though the various file sharing system online such as Drop box, Sky Drive and Google Drive which are useful sharing information. These platforms allow each member of the organization to access information from anywhere whether it is personal computer (PC), (Davenport, 2000.) Smartphones even tablets computers. Depending on the level of management, an employee can access files, which are appropriate to his work. Storing information: Improving database system to help Mobifone have larger space for data storage. With the advantages of technology, Mobifone has more storage choices from flash memory to network-area storage. The best solution is company may create a single central data warehouse where keep all-important data about customer, supplier or financial of company. Each staff member will have personal ID to access data without affecting the use of operational systems. In order to succeed, Mobifone is also investing the higher speed network access to support database system works smoothly. The Information System being applicable at Google tends to have the following categories which serve different levels of the organisation: The operational-level systems, this is responsible for the collection of data and its formatting/processing; The management-level systems, this is generally responsible for the storage of data and information in soft and hard copies; The strategic-level systems, this is responsible for the dissemination of information towards different entities. The operational-level systems perform the conduction of research activities that are performed by the R&D department of Google. The management-level systems perform data storage along with managing the factors of sales, inventory control and budgeting associated with every department at Google. The strategic-level systems perform the distribution of data as well as mechanisms of profit planning, personnel planning and operational plans associated with Google. Some advantages of the Information System used by Google are as follows: It allows better protection and management of data and it assists the users in terms of quick access to their desired information. Some disadvantages of this Information System are as follows: It is deemed as complicated by many of its official users and it is believed to be less flexible in terms of adapting changes within itself. The management at Google can improve its Information System by performing the process of system re-engineering. This would enable the system to not only be more flexible for future changes but also be more effective throughout its current official usage. The process of system re-engineering involves the overall evolution of the presently functional system. This can only be done after a thorough analysis of the entire system is done in advance. This procedure would result in a significant amount of benefits since after the re-engineering process, the newly emerged Information System would be better in all aspects. It would be able to store more data, be easier to use and also more secure. What changes can management adopt and implement to improve the current approach used for collecting, formatting, storing and dissemination of information and knowledge? Firstly, its management must be able to thoroughly monitor the processes of overall business activities. Then, it must collect the relevant data that is required by it for the implementation of its strategy. It then needs to normalise and analyse the collected data, this can be done by performing a thorough analysis upon the data. Finally, it must review the entire process on a regular note. The correct performance of the mentioned steps would enable Google to implement its chosen strategies, which may allow the benefits of better data and password protection associated with its information systems mechanism. Second process collection: The employees must be given training in order to ensure that the data is properly collected and used by employees. It will improve the efficiency of the system. In addition, it will facilitate effective flow of information from one department to another. The information can be stored in hardware and software within the organization. On the other hand, information can be stored in cloud computing also. Internal and external stakeholders can access from the cloud computing from anywhere of the world. Therefore, Google can improve the storing process by utilizing cloud computing or big data. In this competitive sector, this organization can enhance the storing process of different types of information. The information can be distributed to the members of the organization. Stakeholders of the internal and external aspect can be able to collect the effective information with the help of this cloud computing process or big data. Step 1: First, business problem need to be identified. Step 2: change is required in any business for the purpose of growth. Therefore, it is necessary to prepare oneself for the level of change. Step 3: Knowledge management (KM) need to be created to handle the specific problem because they have the required expertise to look into the matter. Step 4: Audit and analysis has to be performed in order to gather knowledge in the particular area. Step 5: key features of the solution need to be defined. Step 6:Knowledge management can be successful if proper implementations of building blocks are ascertained. Step 7:Finally,knowledge can be inbuilt from people so a connection is needed to bridge the gap between the two variables. It is believed that the existing resources to get the immediate return on investment by accessing various knowledge attributes. The mining in various simple knowledge, which can be efficiently accessed. New knowledge can be categorized in the most effective manner in an automatic mode. The staffs and employees of the organization can collect effective information from the cloud computing and big data. These tools are new and innovative. Every business company has taken these new tools for enhancing the process of data collection within the employees. This study focuses on the one of the Top MNCs in information and technology and that is, Google Inc. more emphasis has been given to know how the information and the knowledge work together hand in hand and finally the implement section is the vital most part which needs proper care and attention. The range of various decisions taken depends upon the specialist of Knowledge management who are responsible to guide in the decision makingprocess. The raw data is converted into information by specialist and they know how to extract the internal as well external sources so that to give a brief idea of the business enterprise. Stakeholders are the person who invests its capital in the business so healthy relationship had to be maintained with them so that they do not face any difficulty in the future run. Communication is a flow of information, which is a two way process and it, actually means to share ideas, views and opinions so that there is no sort of problem should occur due to miscommunication. Technology has a vital role in the current scenario and it’s changing every single moment. Creating a knowledge management team is high task, which is possible only if the top executives give their full support in solving out the corporate objectives, which are required in the end. Another feature while updating the knowledge management systems is that it can perform a tedious amount of task in just a single step, which is cost efficiency,and time saver. It is full proving plan after the organization explains its objectives and goals and ready to make the desired commitment of various attributes like, people as well as time. After the approval is made, the knowledge team can easily access and make full efforts in the completion of the work. Barnes, S. (2002). Knowledge management systems. Austalia: Thomson Learning. Curry, A., Flett, P. and Hollingsworth, I. (2006). Managing information and systems. London: Routledge. Desouza, K. and Hensgen, T. (2005). Managing information in complex organizations. Armonk, N.Y.: M.E. Sharpe. Dossick, C. and Neff, G. (2011). Messy talk and clean technology: communication, problem-solving and collaboration using Building Information Modelling. Engineering Project Organization Journal, 1(2), pp.83-93. Gottschalk, P. (2007). Knowledge management systems. Hershey, PA: Idea Group Pub. Kebede, G. (2010). Knowledge management: An information science perspective. International Journal of Information Management, 30(5), pp.416-424. Leidner, D. (2010). Globalization, culture, and information: Towards global knowledge transparency. The Journal of Strategic Information Systems, 19(2), pp.69-77. Maier, R. (2007). Knowledge management systems. Berlin: Springer. Moustaghfir, K. (2008). The dynamics of knowledge assets and their link with firm performance. Measuring Business Excellence, 12(2), pp.10-24. Ruff, P. and Aziz, K. (2003). Managing communications in a crisis. Aldershot, Hants, England: Gower. Sandberg, J. and Targama, A. (2007). Managing understanding in organizations. London: SAGE. Sugumaran, V. (2002). Intelligent support systems. Hershey, PA: IRM Press. Zeleny, M. (2005). Human systems management. Hackensack, NJ: World Scientific Pub. Davenport, T.H., and L. Prusak. (2000). Working knowledge: How organizations manage what they know . Boston, MA: Harvard Business School Press. Hannsen, M.T., N. Nohria, and T. Tierney. ( 1999). What’s your strategy for managing knowledge? Harvard Business Review 77(2): 106–116. Menon, T., and J. Pfeffer. (2003). Valuing internal vs. external knowledge explaining the preference for outsiders. Management Science 49(4): 497. Oliver, S., (2006). How to develop knowledge culture in organizations? A multiple case study of large distributed organizations. Journal of Knowledge Management 10(4): 6–24. William D. et al (2006). When will we ever learn? Improving lives through impact evaluation. Washington DC: Center for Global Development.